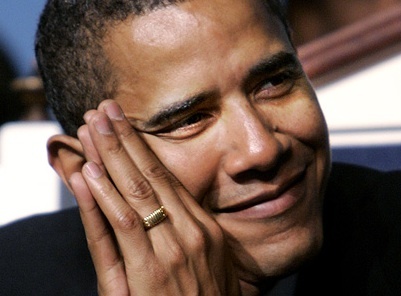 Update: Why Didn’t Obama Disclose His Allegedly Muslim Ring? You are here: Home / We are Gulag Bound / *Resisters' Log* / Update: Why Didn’t Obama Disclose His Allegedly Muslim Ring? “The most transparent administration,” it was supposed to be. I guess that depends on what the meaning of “transparent” is. Those who have chosen to assess the evidence objectively have seen through Barack Obama’s facade for a long time now. We have known him to be a born, raised, tutored, mentored, and career managed crypto-Marxist, who has also maintained a deep-seated affinity for Islam, since the days of his training in Muslim school, in Indonesia. That affinity is now recognized on his ring of devotion to Islam, which also became his wedding ring. Jerome Corsi has the sad story of yet more deceit for this allegedly Christian man, at WND.com. “There can be no doubt…. There are many things one could write here and to which one could link. Along with Noisy Room, Gulag Bound, for instance, was one of the first sites to get the word out, of Obama’s Muslim Brotherhood connections in the White House. We also examined the potential that such liaisons could have been responsible for tipping off the Jihadis who ambushed (and/or bombed) the Chinook helicopter carrying members of SEAL Team Six, after the killing of Osama Bin Laden (if that surprisingly young looking man really was him). I’ll choose just this one story. Two years ago, during one of the Fan the Fire programs on Patriot’s Heart net-radio, hosted by the Gulag’s CJ in TX and Tallulah Starr, a caller named Usama Dakdok informed us that he phoned Obama’s and Jeremiah Wright’s “Trinity United Church of Christ,” in Chicago, posing as a Muslim. He asked them if the church accepted Muslims as members. He was told it did. I confess the title of this entry is a rhetorical question. It’s simple, really. Snuffleupagus was saying that McCain HADN’T been trying to make hay from the idea that Obama was possibly a crypto Muslim. Then, Obama CONCEDES the point that McCain hadn’t talked about his Muslim faith. Stephanopoulos stresses the fact that McCain hadn’t called Obama a Muslim. Then Obama says, yeah you’re right, he hadn’t talked about my Muslim faith. To say he hadn’t talked about his Christian faith would make no sense. Just as with his Marxism, one can go on and on, presenting evidence of Obama’s semi-hidden, but blatantly obvious affinity for the malignancy of “Subjugation” (translation of “Islam”). Umm…. observant Muslim men don’t wear gold… there’s no such thing as an Islamic “devotee” ring… and the picture of his ring contains no Arabic script…. not even close. Davi, there are many Christians who profess to love Jesus, who don’t choose do what He says (and He doesn’t conflict with Himself, as does the Quran, with itself). Likewise, there are many Muslims who loves them their gold, and still groove on the identity and the whole jihad thing. Islam is similar to, or a kind of dualistic, gnostic cult (something which has also inflicted the Church). As long as they go through the motions, they can go on sinning… well, at least their men can…. people have been blinded by hatred and bigotry that they come up with such absurd lies. The drones that he authorizes kill moslims every month. nobody has seen him pray islamicaly ever. From his mouth he says he is a christian. he is about to bomb syria and iran. Thanks for making me to get new tips about computer systems. notebook, however don’t assume all laptop could have a shell on the market. Once more, thanks for your points.